No matter what stage you’re in with your writing, it’s always beneficial to work on craft and technique. Writing Exercises help target common problems and weaknesses. Writing Prompts help get your creative juices flowing. Writers Block happens to all writers. The difference is how you handle your block. 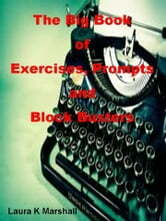 The Big Book gives you valuable exercises, prompts and block busting tools you can use to hone your skills. Pumpkins, Spiders and Bats, Oh My!